After all these Executive Orders, I’m happy to report on a happier topic. The Bestie & I tried a new (to us, anyhow) brunch spot in Dallas. Sissy’s Southern Kitchen is a kitzschy country kitchen on Knox-Henderson. We’ve visited twice and, with a bit of help from family, tried all (but one) recipes on the menu. Since brunch is basically my favorite meal, I believe I found my happiest place in Dallas. Which, let me be clear, is an amazing feat! I mean, this glorious little once-was house, tucked away behind a few trees and their own Valet stand, rivals bookstores and my own kitchen. If you’re ever in Dallas and need to loosen your belt a few notches, stop by Sissy’s. They’ll be more than happy to whip up a lil’ something for you to nosh on. These squash puppies are accompanied by whipped butter and a house-made jalapeno jam. Honestly, I could deal without the puppies, but this jam needs to be in my life. It is sweet, with a surprising bite of spice and sass that battles taste buds. 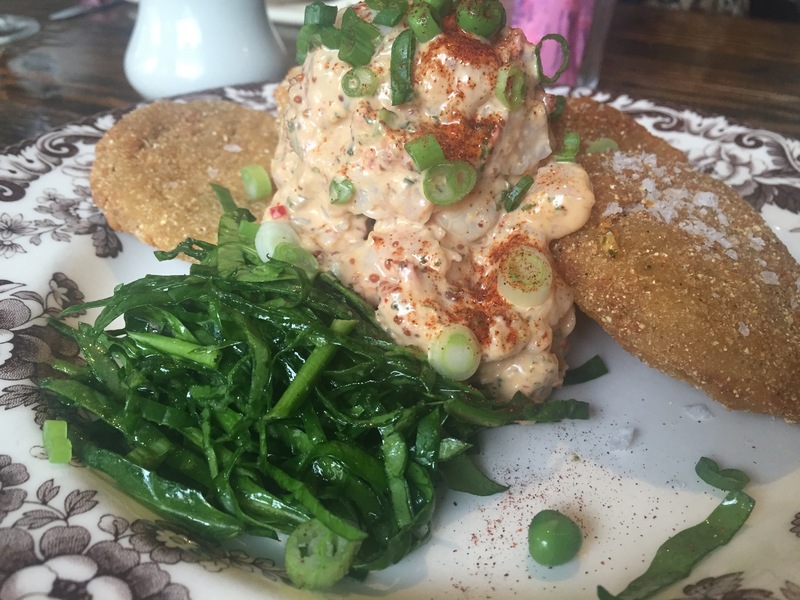 I’d never tried Fried Green Tomatoes – nor have I read the book – but my Mimi said I was missing out. So we just had to order them. Cut to this interesting take on tomatoes landing in front of us. They’re moderately thick tomatoes, evenly sliced, and generously coated in a cornmeal batter; fried to perfection, accompanied by a shrimp remoulade, green peas, and scallions. Did I say, perfection already? 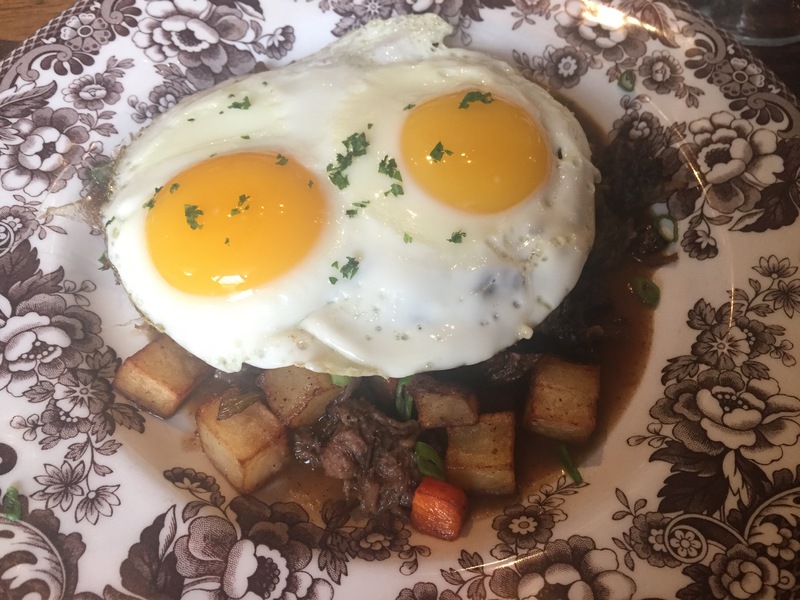 The short rib hash is basically a pot roast, diced potatoes, and sunny side up eggs. I wanted to be more impressed, but this just was not among my top favorites. Don’t get me wrong – it’s still quite tasty, but this hash is simply not Sissy’s best effort here. This dish left me feeling underwhelmed. Do you see all that buttah? 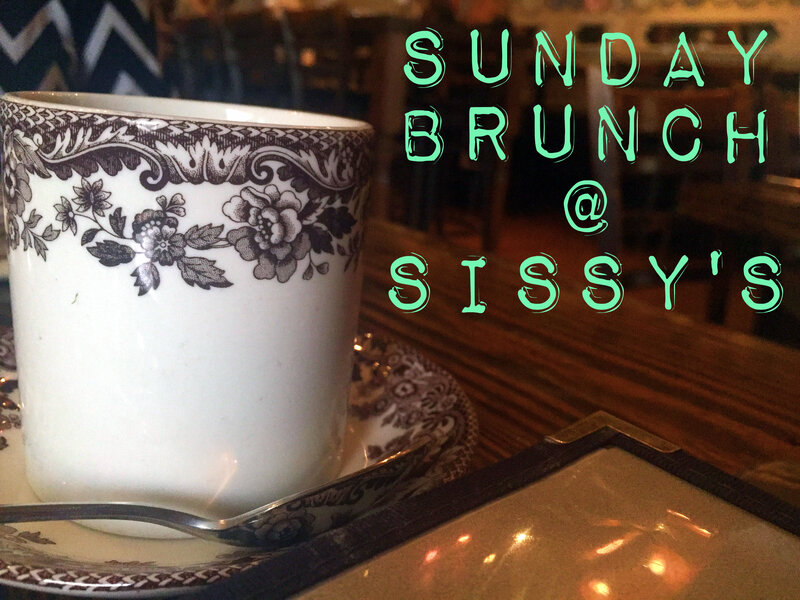 Butter is an essential need to this brunch menu and it’s probably why I love Sissy’s so damn much. 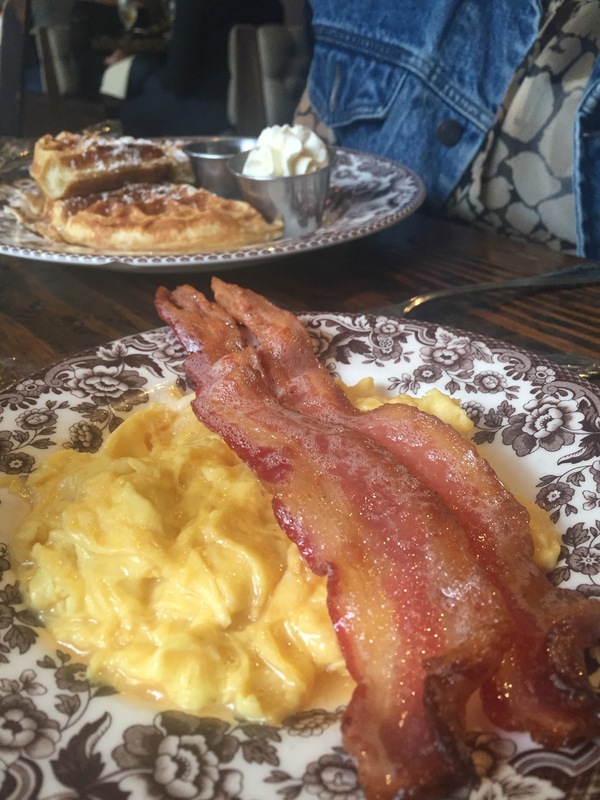 The bacon arrived sizzling and introduced the waffles quite nicely. This. This here. 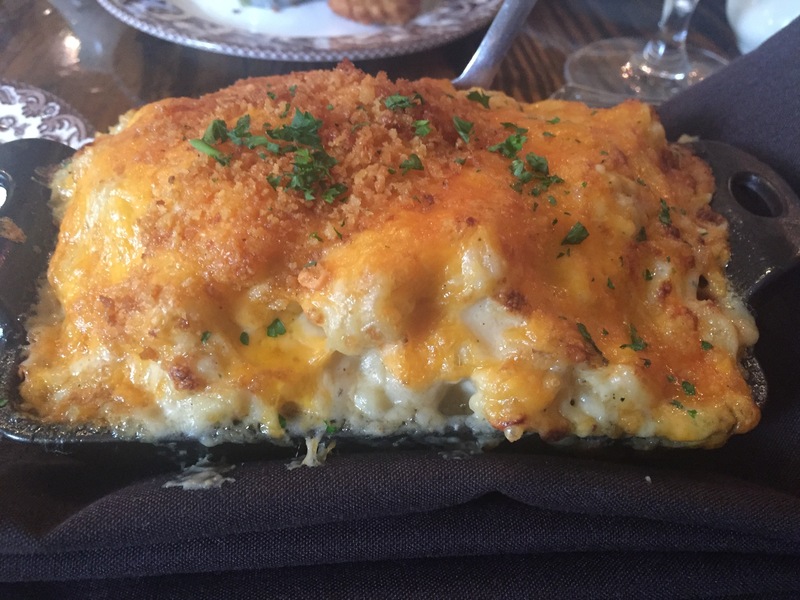 The crab cake mac and cheese has been a Sissy’s special for a few weeks now. I must say, the chef makes a glorious mac and cheese. Don’t believe me, watch the video below. It’ll make your tummy tingly in all the best places. Now, we were pretty full (jeans unbuttoned) by this point. Then the waitress said they made the best chocolate cake in Dallas. The reigning champ, in case you’re wondering, is the Cheesecake Factory’s Linda’s Fudge Cake. I had no choice but to order dessert. Sadly, they looked better than they tasted. Good, but not nearly impressive enough. I hope you have a chance to brunch here. You’ll thank me for the suggestion.